Wichita, Kan. - The holiday season in Wichita offers a variety of events and exhibits that enlighten and entertain with literally something for everyone. Every major attraction in the city offers festivities, and you can see holiday lights from the air, on foot, via party bus, on a trolley tour, while riding in a horse-drawn carriage or from the comfort of your vehicle. A number of events start in November and continue into December, like Illuminations at Botanica and carriage rides in two of the city’s most festive neighborhoods. On Nov. 19, visit Bradley Fair, an upscale shopping and dining district in Wichita, and witness the annual tree lighting of a stunning 35-foot Christmas tree on Bradley Fair Plaza. Santa and his reindeer will be on hand to help light the tree and will be available for photos. After the tree lighting, visitors to the area can enjoy a horse-drawn carriage ride through miles of crystal lights throughout Bradley Fair. 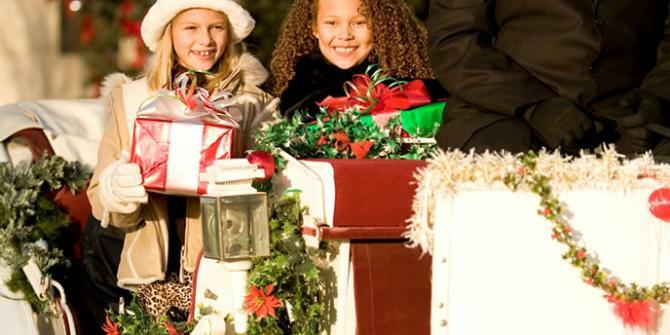 Carriage rides are available through Dec. 23, from 6 to 10 p.m.
Old Town Square Carriage Rides are also available. Riders can take in the ambiance along the brick-lined streets of Wichita’s Old Town, a historic and lively district known for its shopping, dining and entertainment options. They begin Nov. 19 and run through Dec. 17 and depart from the plaza from noon to 4 p.m.
Illuminations at Botanica is an award-winning, family-friendly event, which boasts 1 million lights and runs from Nov. 25 through Dec. 30, and showcases Botanica’s 17 acres of beautiful gardens in a completely different light. This year, hundreds of thousands of lights and new themed displays are being added to make it Kansas’ largest holiday light display. More than 5,000 LED luminaries will line garden pathways, more than 120 trees will be expertly lit, and many structures will be lit with twinkling white lights. As visitors enjoy their walk through the gardens, they will enjoy the warm glow of luminaries, the sound of electric trains traveling around pine trees, the reflections of trees on the pond, the magic of the flocked forest at Candy Cane Lane, the fragrance of chimineas, the warmth of hot cocoa and cider and the joy of live musical groups. Holiday Show at Exploration Place: From Nov. 26 through Dec. 31, soak up the sights and sounds of the holiday season as the popular Kansas in Miniature exhibit at Exploration Place is decked out for a 1950s holiday, complete with a Christmas parade and nostalgic music. Holiday light tours on a party bus are available seven days a week, from Nov. 28 through Dec. 30. Groups can select where they would like to be picked up and can enjoy two hours of fun on a party bus, while stopping throughout the city to view some of the best light displays in town. Throughout December, there are also a variety of light tours that can be taken by the car load. See live reindeer and get your photo taken with them while sitting in Santa’s sleigh at Fulton Valley Farms. Visit www.fultonvalleyfarms.com/dashaway-reindeer for more information. Enjoy Christmas the cowboy way with the Christmas songs and comedy of the Prairie Rose Rangers at Prairie Rose Chuckwagon Supper’s Christmas on the Prairie. The Prairie Rose Ranch will be decorated in its entirety for Christmas from Dec. 2 through Dec. 17. The program also includes horse-drawn wagon rides, movies, the Silver Screen Cowboy Museum and the all-you-can-eat chuckwagon dinner. Gingerbread Village at Exploration Place: Guests will be able to create their own take-home houses and experience Exploration Place exhibits. 2nd Annual Fez-tival of Trees: Stroll through dozens of beautiful decorated Christmas trees in all sorts of themes. Purchase opportunities to take one of the gorgeous trees home. Winter Art Mania at Wichita Art Museum: Decorated for the holidays and filled with galleries of gorgeous art, the museum is bustling and offers a range of joyful, interactive activities. The museum invites families and neighbors to attend with free admission and experience films, live music, artmaking activities, PopUp Tours, and scavenger hunts from 11 a.m. to 3 p.m.
Let it Snow! at the Boeing Dome Theater and Planetarium at Exploration Place: Enjoy this fun family show featuring holiday images and scenes set to favorite songs from Frank Sinatra to the Muppets. A Jolly Jam at Exploration Place: Kick back and relax for an evening of adult holiday diversion. Make your own holiday drinks and décor and build a gingerbread house. Wear your best (or worst) holiday attire and sing along to seasonal tunes by a local a cappella group. Trans-Siberian Orchestra performs "The Ghosts of Christmas Eve": Wichita is one of 60 North American cities where Trans-Siberian Orchestra will bring its winter tour, the live debut of "The Ghosts Of Christmas Eve." Based on TSO&apos;s multi-platinum DVD and long-running PBS fundraiser, the story follows the journey of a young runaway who breaks into an abandoned vaudeville theater on Christmas Eve seeking shelter from the cold and the ghostly visions she experiences from that concert hall&apos;s past. Let&apos;s Make Merry: A Victorian Christmas Celebration & Christmas Dinner: Join an annual holiday celebration in Old Cowtown Museum that provides entertainment to evoke your sense of nostalgia. Plus, stroll through the streets of Cowtown decorated for the holiday in 1880&apos;s style. The Wichita Art Museum Holiday Open House: Celebrate the season with holiday refreshments, live music, and a visit with Santa Claus, courtesy of the Friends of the Wichita Art Museum. Wichita Symphony Orchestra&apos;s Tchaikovsky’s “Sweetest Suites” at Century II Concert Hall: The performance features music from Tchaikovsky&apos;s sweetest ballet suites, "The Nutcracker," "Swan Lake," and "Sleeping Beauty." Seasons Treatings at Sedgwick County Zoo: Watch the animals receive special, holiday-themed treats. Breakfast with Santa and his reindeer Dasher: Santa and his reindeer Dasher will be at Stearman Field Bar & Grill. Enjoy a breakfast buffet and family-friendly holiday fun.